Life lessons. We all experience them, we all learn from them hopefully, and sometimes they sting. Or wait, sometimes rather, they give you 2nd degree burns, on your feet! OK, so maybe 2nd degree burns is a little over the top but, my heart will not get over how freaked out I was! When people tell you to read up on candy making or watch a video, talk to others who make candy.....yeah, you should probably do that. I only tell you that because, I DIDN'T! For a beginner this is really an easy recipe. I think when you make candy you need to start out easy. And make sure you have access to a candy thermometer or you will end up using a meat thermometer. HA! Or you can ALMOST forgot what is bubbling and stick your finger in it to taste it. I am a mess friends, a hot, bubbling over mess. When my temperature got to that very anticipated "firm-ball stage", I kept the pot on the burner, shut off the heat, and added my vanilla. DUH. It blew up, a small explosion but none the less, is scared the hell outta me. 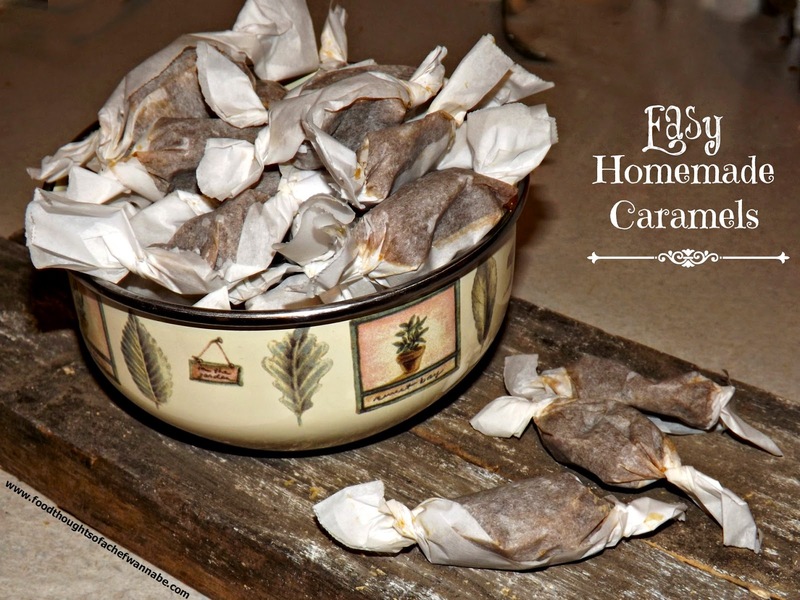 I will make these again because they are so easy, but my candy making days are over. If you need a recipe for candy, ask me, I will refer you to a good website! One thing about these caramels, is you MUST prepare the pan well. I mean, when I tell you that you MUST, you MUST. I used foil, but in hindsight I would use parchment and then I would spray the heck out of it with nonstick cooking spray, maybe even like 4 times over. Yes, use parchment. I also used parchment to individually wrap them, waxed paper is a good alternative. If you cut these into 1 inch squares you will get about 81 candies. Uh-huh.......start cutting girlfriend/boyfriend. These would be a delightful edible gift and if you groove on the salted variety caramel, after you pour the mixture in your pan, sprinkle with course sea salt or pink salt! Hereeeee..we go! Line a 9x9x2 baking pan with parchment. Then spray or butter it WELL with non stick cooking spray. Set aside. In a large pot add all ingredients EXCEPT the vanilla. Clip a candy thermometer to your pot and stirring almost constantly bring your mixture to the firm-ball stage. This will be 242 degrees F. This took me about 19 minutes on medium heat. Don't use more than medium or you will burn your mixture. Your mixture will be a moderate, steady bubble. Remove the pot from the heat. remove your thermometer, and add vanilla. BEWARE, you will have a mini volcanic eruption on your hands, so thus, using a large pot! Maybe if you use a large pot you won't have an eruption but I had one, so I am just putting it out there into the universe, wear socks! Pour immediately into your prepared baking dish and let cook in the fridge. When it is set, use the parchment to lift the caramels out and a buttered knife to cut into 1 inch squares or whatever size you like. I did bigger pieces as you can see.